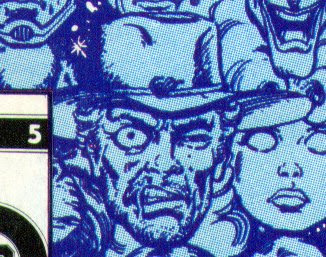 Jonah Hex didn't make a significant appearance in the rest of the Crisis, only appearing on two covers and one group shot. Thankfully, Jonah's cover shot didn't get hit by the UPC box! 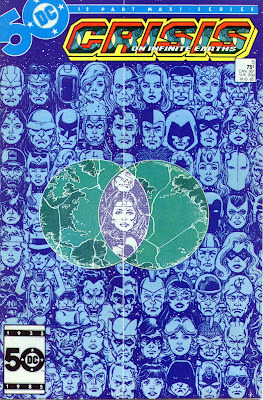 He is visible in the lower left part of the cover. 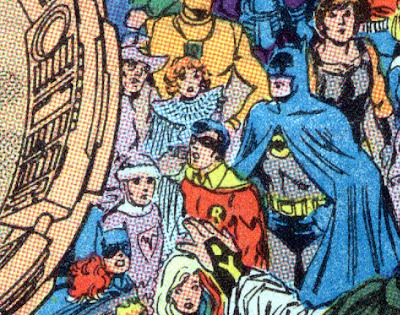 He also makes an appearance in a huge group shot of everyone being gathered together on the JLS satelllite. You can barely see him standing next to Kole. 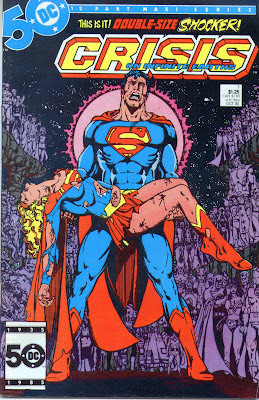 His final appearance was on the cover of #7, the death of Supergirl cover. Jonah is visible in the lower right corner, standing next to Blue Devil. 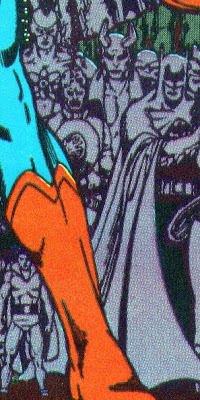 And that was all that you saw of Jonah in CoIE except for when the trade came out, old Jonah and thrown-into-the-future Jonah were both on the cover and on the poster. That's kinda weird since the Crisis had nothing to do with Hex ending up in the future! Not very good pics, I'll have to see if I can nab better ones off the web since I don't own this trade. I...I never noticed Jonah was on the Alex Ross cover. Not too surprising, since my eyes start to cross after I've looked at it for too long. Nevertheless, I would love to have that as a huge poster in my study.